Welcome to the whole horse newsletter. We believe that every part of a horse's life is important. Both for his own well-being and for the success of your training program. This newsletter brings together the management and training aspects of a particular topic, giving you a holistic perspective on the horsemanship issues we encounter every day. 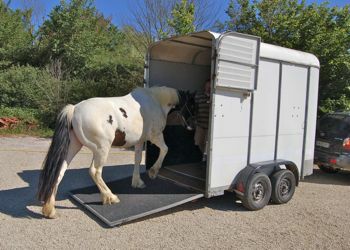 Loading your horse into a trailer or horse-box is a straight-forward enough task, unless the horse has an issue about it. Then it can become a real ordeal, and requires an intelligent and understanding approach to solve the problem. The bottom line when we are attempting to load a horse is 'will my horse go where I ask him to'. If he won't it is helpful to consider why he won't. 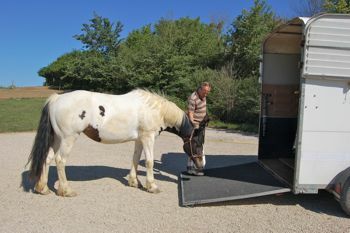 Unless you have a horse who has never gone in a horse box or trailer before, it is unlikely that he doesn't understand what is required of him. Often we tell ourselves that, because we don't want to believe how aware horses actually are of everything we want them to do, or because it is a good excuse to save us the effort of thinking abut why, in reality, he doesn't want to go in there. He is frightened to leave the herd or his friend at home. He is frightened of traveling. He doesn't trust the trailer. He doesn't trust people so will not follow you into a scary looking place. He is frightened of what happens at your destination. He does not feel well enough to travel. The reason can of course also be a mixture of the above, but if he does refuse to load, whether it is habitual or not, the first step to finding an answer is understanding the problem. Most of the reasons above, which result in a problem for you loading up, happen because the horse is not accepting you as his leader. The rest of them happen because the horse has been traumatized in the past and this memory overrides the trust he has in you, whether it is strong or not. It is easier to win a horse's trust if he hasn't been traumatized of course, because his willingness to face the situation you are confronting him with is much greater. In other words he stays more present. This is the key to success in all situations with horses. If he stays aware of his present circumstance, and you are not hurting him, sooner or later he will follow your guidance. Horses who have been traumatized in the past will lose their awareness of the present moment when they are presented with a similar situation i.e a trailer ramp and slip back into the panic they suffered then. It doesn't matter how long ago it was, or if it was a different place and different people. When he is then 'in the past' he can't hear you because he is panicking, and he won't do what you ask him. Happily there are simple, safe ways we can help horses to accept our demands, even traumatized horses. 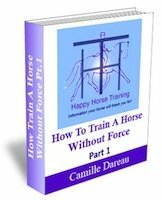 It requires only as much patience as is necessary in each case, and an understanding of what your horse is feeling and thinking. This understanding is a crucial part of being a successful horse-owner, and taking the opportunity to develop it is one of its joys. When a horse accepts our demands on the ground, he will also accept them under saddle. In fact it is always the same demand we are making; on both the mental and the physical level, we are asking the horse to 'yield'. When training a horse, we have found that focusing on the accomplishment of the physical yield from any horse will build confidence in us, which brings us closer to the mental yield. A horse can always decide at any point that he is withholding his trust in you and therefore blocking you out of his body. Some horses are much more likely to do this than others, but in any case, you can never force a horse to trust you, so you must use the physical yield as a bridge towards him, not as a way of pushing him away. By using the body language of the herd, but in such a way that comforts your horse, not in a way that frightens him. Many current training methods are using horse body language, but not always to communicate friendship and compassion. Often they are using the body language of threatening behavior when horses are being aggressive towards each other. Your horse will accept you as his leader and therefore trust your judgment and follow your guidance better. 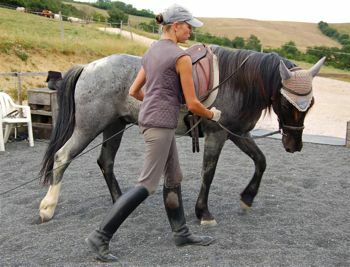 Your horse will develop the correct posture and therefore find his work more and more enjoyable. 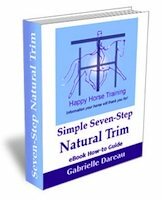 Your horse will be secure in himself and therefore safer and easier to handle in different circumstances.